On St. Patrick’s Day, all eyes are on New Oxford resident Jerry Spratt, Jr., no matter where he goes. It could be the spring in his step, the smile on his face, or even the twinkle in his eyes. More than likely, though, it’s his green hair, pot of gold coins, and shillelagh. You see, Spratt is a leprechaun…at least on St. Patrick’s Day. One place this leprechaun can be spotted every St. Patrick’s Day is at Carroll Springs School in Carroll County, Md. It’s a public school for students with severe disabilities. Many of the students, who range in age from 3 to 21, are wheelchair bound. Others have trouble communicating, but all of them love their personal leprechaun who brings them good luck. He’s a sight to behold with his green suit and hair. He greets everyone with, “Top of the morning to you,” and he calls the boys and girls “laddies and lassies.” He may dance a little two-step to get the kids smiling. Then, he’ll settle down to read to them. A few of the more daring students may want to pat his green hair or just hug him. Then, he’s off to visit one of what may be a dozen or more stops that he makes every St. Patrick’s Day. “We aren’t the only place he visits, but we are the place he always visits,” Glas says. Spratt, Jr. isn’t the first leprechaun in his family. Back in 1950, Jerry Spratt, Sr. was a beat cop working in Marlborough, Mass. He decided to wear a green tie and a green carnation on his uniform that St. Patrick’s Day. The chief of police saw him and stopped. “Top of the morning to you, chief,” Spratt, Sr. said. Spratt, Sr. decided that he would rather take the day off. “He believed that in order to do goodwill for people, he needed the day off,” Spratt, Jr. says. Spratt, Sr. began dressing up in green and visiting places around the area. He would sing songs in his rich, Irish brogue and dance. He became so popular that he would be booked up with stops for two weeks before St. Patrick’s Day. He eventually ran for city council and won because he was so well known from his work as a leprechaun. “My dad was a true Irishman,” Spratt, Jr. says. The only year the Spratts missed donning their green was in 2007. That was the year his father died on March 13. 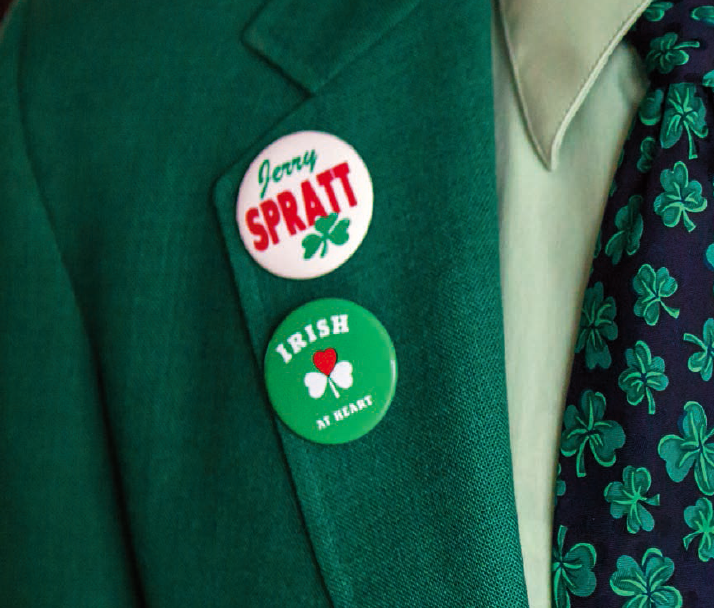 As close as it was to St. Patrick’s Day, Spratt, Jr. was still planning his father’s funeral. “It would have been his 57th year dressing up, but it was the first year both he and I missed St. Patrick’s Day,” he says. And so, he put together his first outfit and dyed his hair green. His first stop was the students at Carroll Springs School. He gets up at 6 a.m. on St. Patrick’s Day to start getting ready. His wife uses a temporary green hair spray to color not only his hair but his eyebrows, too. A little girl once asked him why he wasn’t short with red hair like the leprechauns she had seen in pictures. He quickly explained to her that the short, red-haired leprechauns were from southern Ireland where it’s hotter, and the sun is higher in the sky. The explanation satisfied her curiosity. Next, he dons his outfit. He used to use his father’s original green blazer until he wore it out. However, he does wear the shamrock tie that the mayor of Dublin gave his father years ago. He also wears Irish socks that his dentist gave to him. His suspenders are decorated with shamrocks. He wears green gloves. They used to be his gloves from his old Air Force uniform dyed green, but he wore them out. His shoes used to be dyed green as well, but after he had worn them out, he found some green running shoes to wear instead. His original green hat was created by a teacher at Carroll Springs School. As he started to wear it out, he decided to donate it to the school. Now, he wears a green hat that his wife decorated for him. By 7 a.m., he’s out the door heading toward Carroll Springs School. “When they know I’m coming, they organize and decorate all of the classrooms for St. Patrick’s Day,” Spratt, Jr. says. After Carroll Springs, he usually visits the Carroll County Board of Education, where he used to work as the first coordinator of school safety from 2001 until he retired. He visits the offices of some of his doctors and the bank where he does business. Sometimes, he’ll visit other schools or senior centers. In all, he makes about a dozen stops during the day. He’s happy to visit wherever he is invited. Most people smile when they see him, but some give him odd looks. “When you put on any type of garb like this, you never know what their reaction is going to be,” he says. 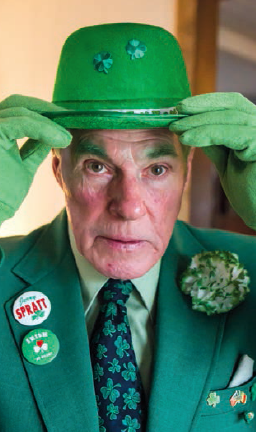 Spratt, Jr. is 75 years old this year and has been dressing up as a leprechaun for 26 years. He has a scrapbook full of mementos of his time as a leprechaun, but the ones he treasures the most are the handmade cards and thank-you notes from the students he visited.